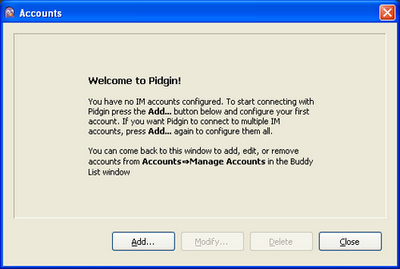 Click here to download Pidgin chat client. If you already have Pidgin installed, you may skip this step. You’ll probably start with the below screen. Click the Add button. “Accounts -> Manage Account” will also bring you to the same screen. Let’s add Gtalk to Pidgin. 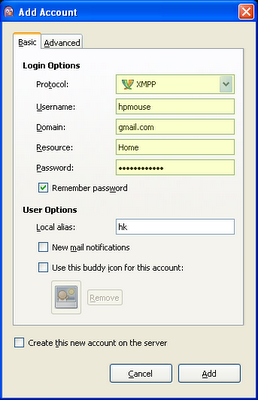 Clicking Add will allow you to add new Gtalk account. The following two screenshots show what you need to fill up for Basic and Advance tab. With all the settings properly entered, you should be able to connect to Gtalk and load your contacts successfully. 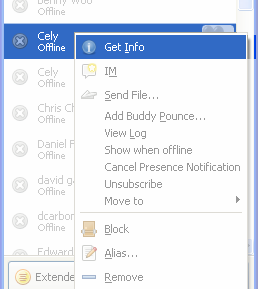 When someone blocked you in Gtalk (and other IMs), they appear offline just like your other contacts who are really offline. Right click, click on Get Info, and we’ll see how to differentiate them. The following image is a comparison of 2 different contacts: Actual offline (left) and Blocked offline (right). If you are blocked, nothing will display under Buddy Information. Thats all. Now you can easily find out who is really offline and who is blocking you from google chat.